In my quest to desperately squeeze the last bits of summer out of this month, I decided to take a trip to the Great Salt Lake in an attempt to float. 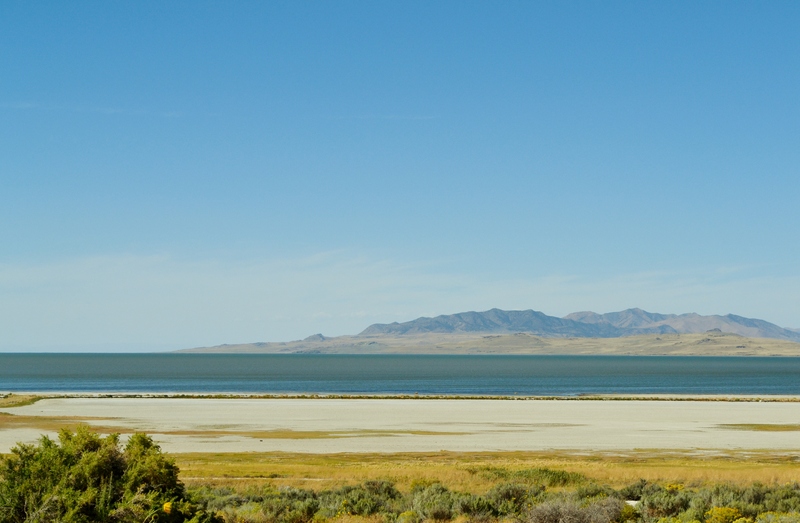 The Great Salt Lake is enormous and one of the saltiest bodies of water in the world. It’s about 25% saline. Even people who haven’t been to Utah or spent much time here have seen it from an airplane window seat. From the sky, it’s a strange blend of blues, greens, reds, pinks, and blacks–strange colors that most don’t associate with bodies of water that haven’t experienced an oil spill. Those colors are created by microbes, algae, sulfur bacteria, and other…stuff. It’s beautiful and weird. In the past, my only experience with the Great Salt Lake was at the Great Salt Air, which is an events venue that has burned down, like, three times in the last century. There, the beach is crusty and weird. Brine flies cover the ground. The place is littered with the wings of dead bird sticking out of the ground. Half the face of a gull. Everywhere. These conditions can be found all over the lake, but I’ve since discovered that some beaches are better than others. Fast-forward to Saturday. 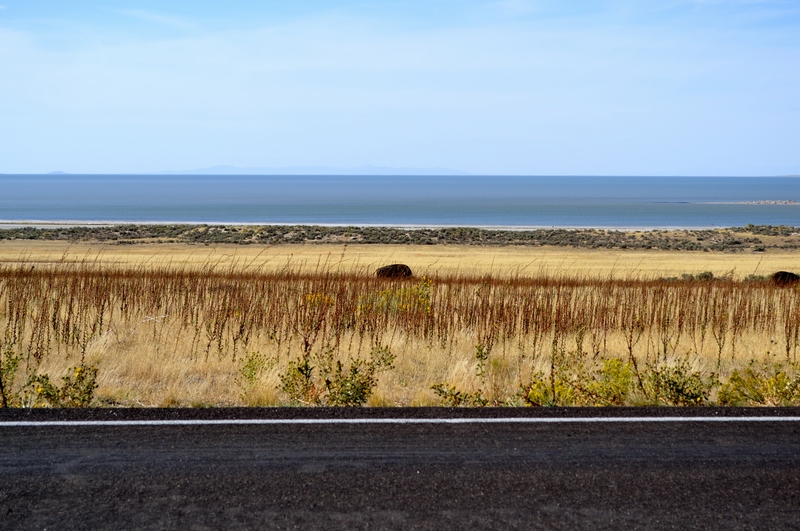 Z and I drove (the relatively short distance) to Antelope Island with the intention of floating in the lake. According to the weather report, it was going to be one of our last weekends of summer, and I wanted to make the most of it. Despite “high wind warnings,” we threw some sandwiches and junk in the car and took off. Antelope Island is beautiful. We ate lunch at a rocky outcrop, which ended up taking awhile to climb in and climb out. Then, we wandered around the island until we came across a beach area with showers. This is a must because floating in the Great Salt Lake is not for the faint of heart, and when you’re done, you definitely want to shower off all of the salt and sulfur smells. By the time we got to the beach, the wind was really blowing hard. Blowing sand stung my legs and face. Regardless, I pulled off my outer clothes and made my way toward the water. This beach was much nicer, and there were a couple of groups already floating in the water. The brine flies were not a problem, but I wonder now if that’s because of Saturday’s high winds. We waded out to our thighs. The wind was blowing so hard we alternately had to talk each other into staying and trying to float. I was the first submerge up to my torso in the water, but Z was the first to actually lay back and try to float, which he did–easily. Finally, I took my turn. With visions of brine shrimp in my head, I had some vague idea that I’d like to float without actually getting my hair wet. I’ll bet that’s possible because it is so easy to float out there, but the wind and the waves made it impossible on Saturday. So, I just went for it. And, it was awesome. The water temperature was cold, but once I was submerged, it felt nice. I am newly in love with this beautiful state. I had a strong sense that spending long lengths of time floating in the Great Salt Lake would be good for the soul. I definitely plan on doing it again. And again. When I got out of the water, the water dried immediately and left a layer of crusty salt all over my skin and hair. I showered it all off, but the next day and today my skin has felt incredibly soft. Hot springs often tout themselves as being healing and medicinal, and I think that can be true. 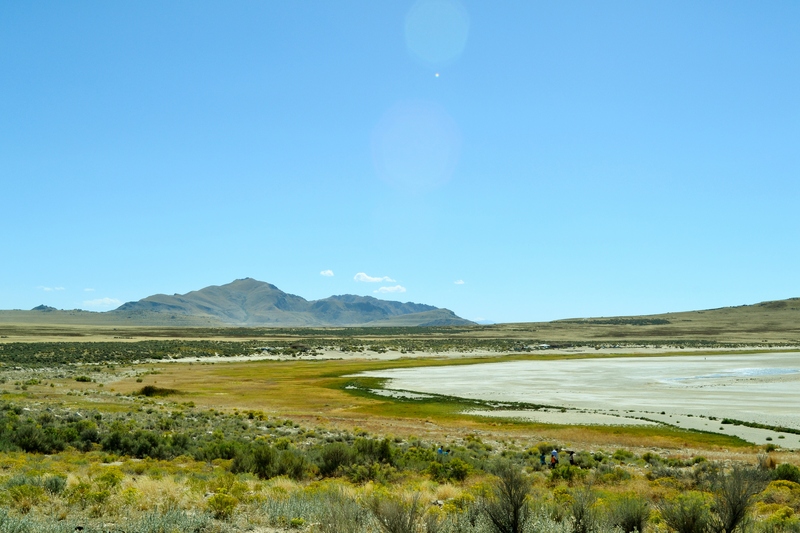 However, the Great Salt Lake is the only body of water where the benefits of the water have lingered. It had the effect of Epsom salts. I know the water is sometimes polluted because it has no outlet, but I think the salt has a way of negating some of that. The water where I was seemed clear and clean. It felt good on my skin. It felt good to be buoyant, and it beckons me to return. This entry was posted in enlightenment, life, travel on September 23, 2013 by sherewin. Where was I? Oh yeah, m-a-n-i-c! I keep saying that in casual conversation, and it takes people aback. I can’t imagine how secretive it must feel to have actual mental illness or depression. People know how to react to physical ailments, but mental ones are a whole other story. Maybe I shouldn’t use the word manic, but how else should I describe this crazy/hyper increase in creativity and energy. It’s wonderful! I’m accomplishing all of the things. I have energy. Yes, staying focused is a little challenging, but I’ve been newly decisive in ways that I haven’t been able to muster in, dare I say?, years. That means buying all of things and making all of the plans. Throughout the summer, I considered buying my first home. It’s hard to know what to do, but now, I’m so glad I don’t have the responsibility of a home and am not chained to a mortgage. Instead, I’m going to enjoy this year by spend my money traveling, buying a new car, and skiing. I’m also trying to squeeze every drop of summer out of September. I spent last weekend in a hospital doing doula work. Hopefully I’ll have a few good weekends of summer left. I still want to be in the water, but the leaves are turning on the mountain, and soon I’ll need to shift to winter. This entry was posted in enlightenment, life, travel and tagged health, mental-health, nature, outdoors on September 17, 2013 by sherewin. Normally, I consider myself to be very sane. Whenever that varies, it’s almost always based on circumstance. This summer, I got the blues (THAT’S ME!) due to circumstance. So, I threw myself into a creative project, work started amping up for fall, and I spent the weekend with an old friend whom I love. Now, I am officially on a manic upswing. I have zero appetite and AM DOING ALL OF THE THINGS! It feels amazing, and I’d almost like it last if I didn’t know better. This fun little ride will come to an end, but before it does, I’m enjoying the hell out of it. This entry was posted in life, Uncategorized on September 11, 2013 by sherewin. While I was gone last week, Z kindly agreed to keep my plants alive. In addition to daily hand watering, it also involves dragging the hose across the lawn a few times a week to water the little north garden. When I returned home, I was glad to see that all of the plants appeared to have been watered. 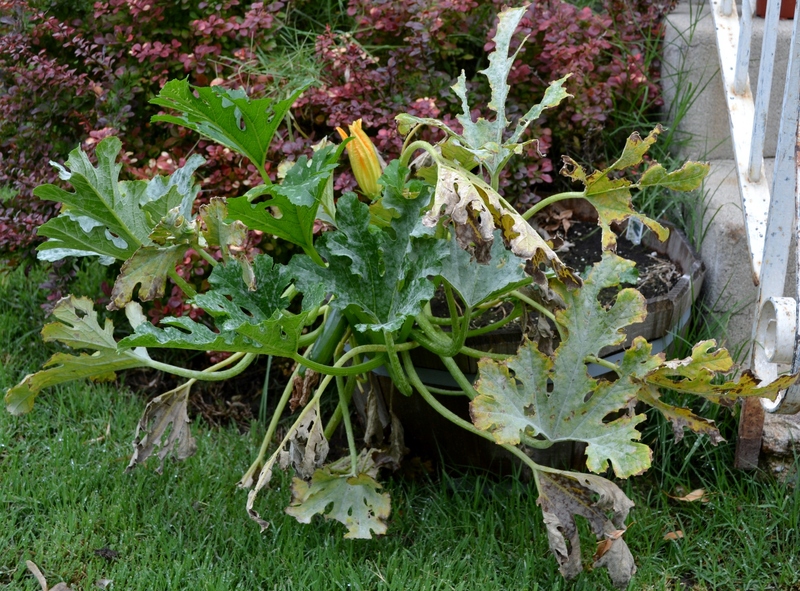 However, the zucchini plant looked absolutely mangled. Z noticed that it looked bad, but didn’t know what had happened. Perhaps a major windstorm? Last night when I pulled the hose around to the north side of the house, I figured it out: the hose probably had been dragged over the zucchini plant. I’m not going to lie: I really liked the zucchini plant and was sad to see it in such a sorry state. I wondered if he was agitated about having to water the plants, was he just careless, or was it an absolute honest mistake? 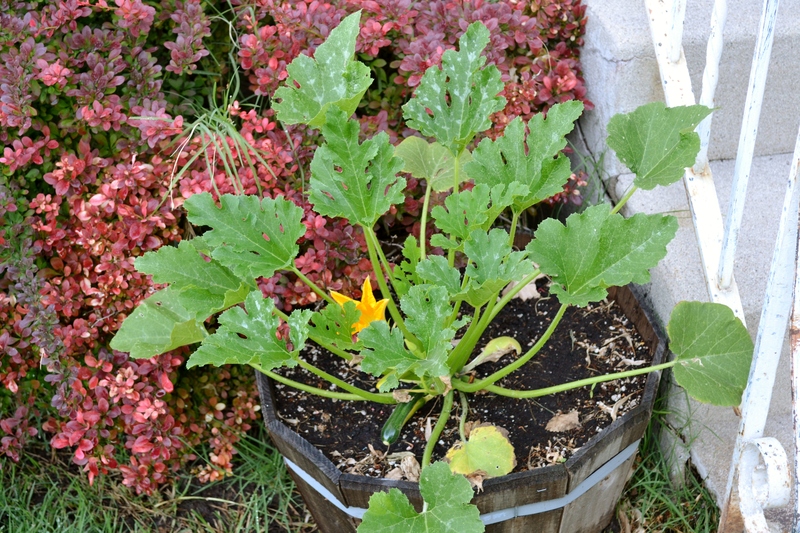 Zucchini plant a month ago, during happier times (though if I look closely, the leaves already have some type of blight). As someone who is nourished by time alone, I often wonder if a relationship is really right for my soul, and nothing brings out these thoughts quite like when my guy mangles a beloved zucchini plant. I don’t have to think about it very long before I think decide that yes, it’s worth it. This guy makes me really happy, life is better with him, and compromise in this relationship isn’t really compromising myself. Still, I’ll probably always be haunted by something a mentor said to me: that her relationship was never a compromise. This is a woman whom I admire, a woman who is in the second half of her life so to speak: second partner, second career, etc. Having relationships, having children, etc. all seems like a major compromise. My dad says I’m too selfish. This is not necessarily an insult, though it may be intended as such. I think most of us have some sort of inherent selfishness as part of our own self-preservation. Here’s the thing, plants that think they’re dying tend to put on fruit like crazy–a last ditch effort at their own self preservation. Previously, the plant put on about one fruit every few weeks. It was slow steady progress, but given the limitations of patio gardening, I was happy with the output. Now, the plant is ugly, but it has two zucchini plants on it, which is a first, and several new blooms!something that wouldn’t’ve happened if I hadn’t welcome someone like Z into my life, who has a different way of doing things, a way that leads to more abundance than my way of doing things alone. This entry was posted in garden, life, love, relationships, travel on September 1, 2013 by sherewin.